Who are the parties involved in import customs clearance formalities in Belgium? Import cargo clearance in Belgium Customs. What is the customs process in Belgium to import? How is import cargo released from Belgium Customs to importer? 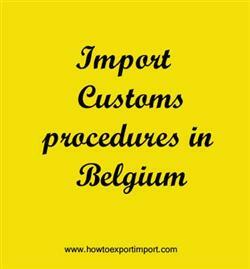 The information provided here details on how to import goods to Belgium especially import customs clearance procedures in Belgium. The official Customs and Excise department of Belgium is administered by Federal Public Service under the Ministry of Finance (FPS Finance). How can I clear customs to import in Liège. What Customs formalities required to import in Antwerp. Import customs procedures required in Brussels. Import Customs process in Ostend . Process to import to Antwerp. Requirements of customs to import to Liège. Customs requirements in Brussels to import. Customs needed to import to Ostend .